Jessie has not been shown since last May 2016 due to commitments here at home. Jessie never missed a step and showed her heart out. Thank you Courtney so much for handling Jessie. Here at Wingdari we do not show the dogs every weekend. When the dogs go out and win it is on the own merits. Just so proud of Courtney and Jessie. Really excited about this pup. "Jessie" is a live wire to live with - always on the go. 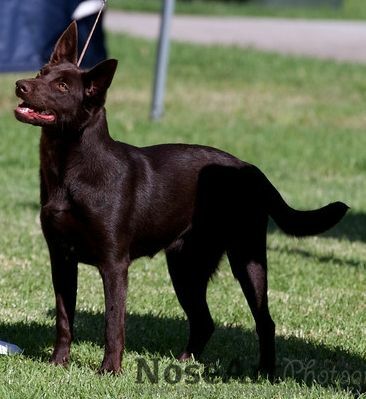 "Mia" the mother of "Jessie" is a gentle soft girl with a beautiful nature. Our "Jessie" is happy and outgoing just like her father "Ben". Looking forward to having some fun with "Jessie". 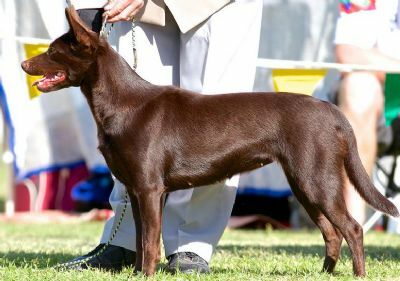 Photograph taken at Sydney Royal 2013 in the Puppy Class Jessie just 6 mths and 2 days. Jessie was handled by Courtney. Thank you Courtney for handling such a little handful of mischief. Photograph courtesy of Gail Ingosoll - Ingenue Border Collies. Thank you Gail for the lovely photograph. 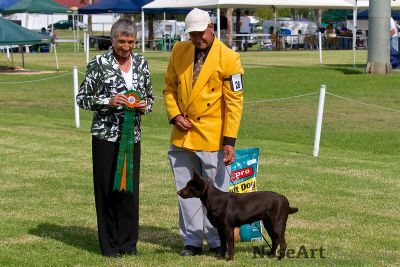 Thank you to Jaime and Brendan from NoseArt Photography for the lovely photograph of Jessie at the Aust.Kelpie Speciality Show Easter 2013 where Jessie won Minor Puppy In Show.